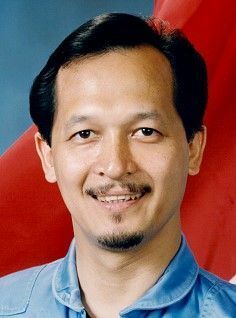 Indonesian engineer payload specialist astronaut, 1985-1986. Status: Inactive; Active 1985-1986. Born: 1951-01-08. Birth Place: Medan. Bachelor of Science from Bandung Institute of Technology, 1975. Engineer in the field of telecommunication, involved in the development of the Palapa Satellite-System. Director Human Resources, Perusahaan Perseroan PT Telekomunikasi Indonesia Tbk. Family: Astronaut. Country: Indonesia. Flights: STS-61-H. Bibliography: 4452, 5092.